This is yet another episode that exemplify Sesshomaru's powers. While Inuyasha and Hakudoshi had a hard time trying to get past Gozu and Mezu, Sesshomaru just had to flash Tenseiga and Gozu and Mezu knelt before him. "Because a half-demon has invaded Father's grave." Sesshomaru's words can be taken at two levels, I feel. 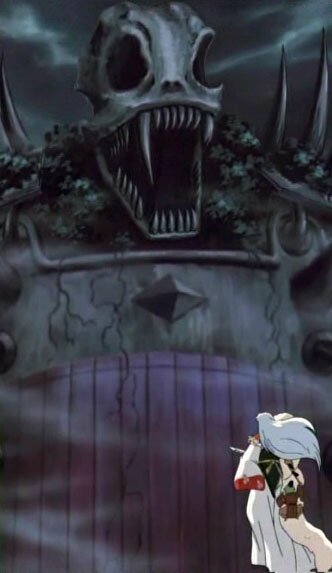 On the surface, it seems that Sesshomaru punched Inuyasha the half-demon for being in Father's grave. 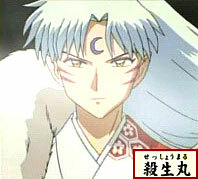 But at another level, Sesshomaru could have punched Inuyasha for letting Naraku the half-demon enter Father's grave, that he failed to protect the honour of their fathers. Note that Sesshomaru actually put down his sword to slug Inuyasha in his face, insteading of just hacking him away with his sword. A slight change of attitude towards his little brother perhaps...? KAG: At the boundary, Naraku tried to get hold of the fragment. Sesshomaru has finally arrived! The brothers will fight each other in front of their father's grave!